In late August and early September 2012, the state-sponsored Caijing Magazine ( 财经杂志) published a three-part essay by Deng Yuwen (邓聿文 - vice editor of the Communist Party weekly Study Times 学习时报) entitled "The Political Legacy of Hu-Wen" (胡温的政治遗产). 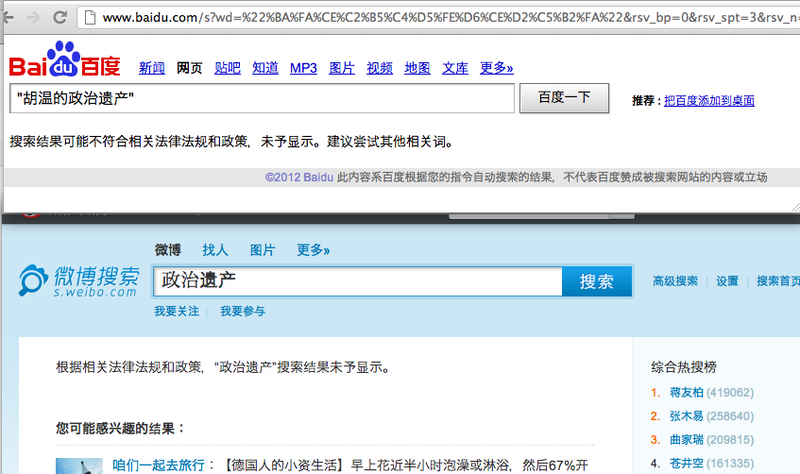 By September 5, Caijing had deleted all copies of the essay, and search engines and Weibos were censoring searches for the title. 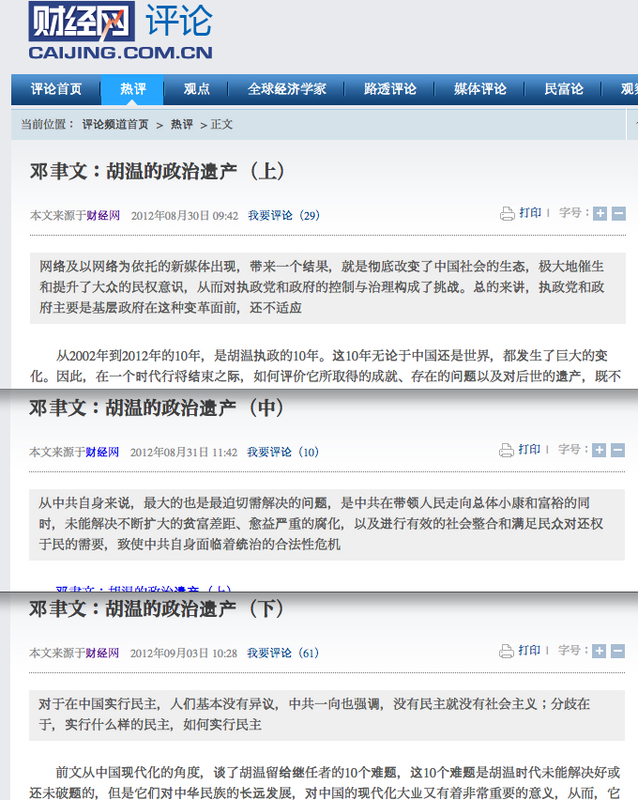 These screenshots show that, at some time between September 3 and September 5, a post about the third installment of the essay on Caijing's official Weibo was deleted. 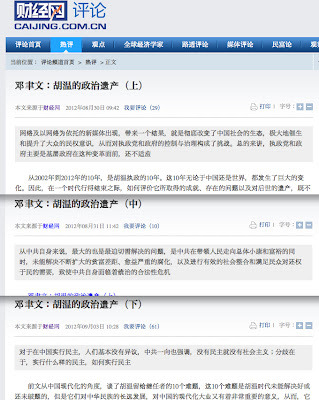 These screenshots show that, at some time between August 31 and September 4, a copy of the first installment of the essay posted Sina.com.cn was deleted. 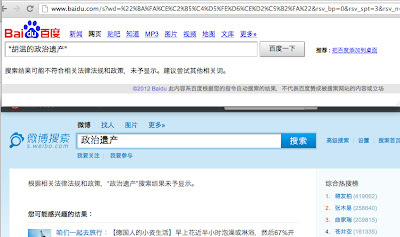 These screenshots, taken on September 4, show that searches on Baidu for "The Political Legacy of Hu-Wen" and on Sina Weibo for "Political Legacy" returned no results, just a censorship notice. The Internet and the new media that depends on it have brought with them a singular result, which is to thoroughly alter China's social ecology, tremendously promoting and raising people's civil rights consciousness, and posing challenges to the control of the ruling party and the government. Generally speaking, the ruling party and the government (primarily basic-level governments) have yet to adapt in the face of these changes. As for the Communist Party itself, the biggest and most pressing problem that needs resolving is that, while the Communist Party leads the people to overall health and properity, it is unable to address the ever-expanding wealth gap and increasingly-severe corruption, and implement effective social integration and satisfactorily hand over power to the people, with the result being that the Communist Party itself faces a crisis of legality of its rule. With respect to China realizing democracy, people basically have no objections, and the Communist Party consistently stresses that there can be no sociliasm without democracy. Disagreement arises as what kind of of democracy, and how to realize it.